The magnificent left geographer and prolific California historian Richard A. Walker has great hometown affection for the San Francisco Bay area. He praises its dynamism, wealth, environmentalism, multi-culturalism, intellectual ferment, rebelliousness, and progressive politics—all parts, Walker shows, of how the region became the tech capital of the world. * The “undeserved credit” (and profit) that the heralded Bay Area tech elite (headed by “entrepreneurial giants” like Steve Jobs, Elon Musk, and Mark Zuckerberg) has taken “from things that are social products, not the work of individual genius”: “the economies of urban concentration;” “the progress of technology:” government research and development; the alienated and often tedious labor of the region’s many “skilled techies;” a disproportionately non-white low-wage regional workforce; a “tsunami of surplus value” extracted from super-exploited proletarians working under terrible conditions in China, Asia, and other parts of the global capitalist periphery (Chapter 1). 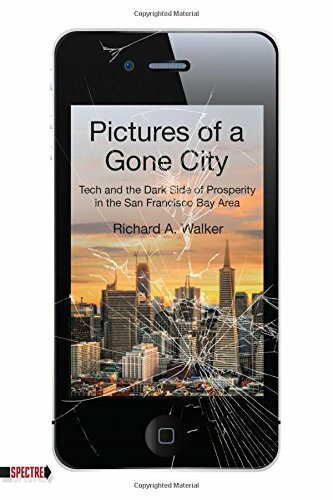 * How the Bay Area’s tech-driven boom comes at the cost of other, left-behind regions while putting the Bay Area itself at risk of collapse when (as the timeworn waves and cycles of global capitalism guarantee) the boom goes bust (Chapter 2). * The savage expansion of class and related racial, ethnic, and gender inequalities as the tech boom make the region’s rich richer than ever before while its multiracial working-class struggles with the collapse of unions, the rise of a racist mass-incarceration state, the subtle underlying white-supremacism and misogyny of the hegemonic tech industry, and runaway classist and racist gentrification, replete with notoriously impossible housing prices leading to the “intense recolonization of the core cities of the Bay Area” (Chapters 3 to 6). * Monstrous urban sprawl that enriches developers while assaulting livable ecology and furthering the region’s pronounced segregation by race and class (Chapter 7). * A giant toxic environmental footprint that belies the region’s proud Green legacy and reputation (Chapter 8). * Massive regional investment in and reliance upon an information technology revolution that “endangers people’s jobs and privacy, modern society’s hard-won knowledge and grip on reality, and even the future of popular control and democratic government” (Chapter 9). * A not-so (pseudo?) Left political culture that that is “compromised by its own [capitalist] success.” Decades after it launched such remarkable portside developments as (to mention just a few) the Oakland General Strike (1946), the Berkeley Free Speech Movement, and the Black Panther Party, the Bay Area is increasingly devoid of any serious, durable, united, and powerful Left. It is dangerously “in the thrall of big money and conventional nostrums for the grave social ills that plague the nation.” The Bay Area “Left” offers no “systematic response to the perils presented by the resurgent Far Right,” whose more Los Angeles-based predecessors (from the John Birch Society and before through Ronald Reagan and beyond) have long used the “radical” San Francisco area as their favorite political whipping boy. Walker concludes by writing that the region “badly needs a new upsurge of radical organizing if it is to once again act as a beacon of social progress in a darkening time.” That conclusion is certainly true, but it is also rather elementary, applicable to pretty much any region of the world today, and Walker offers few specifics about what precisely organizers should demand from concentrated wealth and power within and the beyond the Bay Area. Still, Pictures of a Gone City is a remarkably instructive, richly researched, and masterfully crafted reflection on the perils of what passes for progress and prosperity under the modern system of class rule that we call capitalism.